A couple of days poking around Odessa . . . is enough for us. We picked up some great history about Odessa's Jews from a personal tour of the Migdal Museum, and from a walking tour of Moldovanka, the Jewish neighborhood where my grandmother's family likely lived. (There are still 25,000 to 40,000 Jews in Odessa. As illustrated in the stories of Shalom Aleichem and Isaac Babel, Moldovanka was a colorful place, founded by Moldovan farmers outside the city limits of Odessa but quickly transformed into a tax haven for smugglers. The Jewish Hospital there, where my great-grandfather probably worked as a nurse, covers many acres and is still in use, though quite decrepit. It's scheduled to be knocked down next year in favor of a new facility, which no doubt is much needed. It does not look like a good place to be sick in now. In late August, though, Odessa is mostly a beach town, with lots of explosed flesh, much of it singed by the sun. The weather's been very warm, but the beer's been cold. We are ready for the U.S. of A. Cold kicking it in the Rev. Nagys car (in his driveway) as he blasts and sings along with the Hungarian band Omega, which sounds like a cross between Pink Floyd and The Who. This pic was taken after a substantial helping of homemade wine, which the good reverend makes in the cellar. Today, obviously, is a day off the bikes. We set off from Cluj-Napoca yesterday, and (amazingly) it felt good to be back in the saddle. For about ten minutes. Then we hit the 3-plus mile hill out of Cluj, which involved major traffic. It was a long pull up, then a terrifying run down the other side, on a major four-lane road. It was a pleasure to get to Turdu, which is otherwise a pretty grim industrial town, because the road shrank to two lanes and the traffic slowed enough to allow jumpy cyclists (e.g., moi) some peace of mind, even on a very warm day. We have found the hills of Transylvania -- three more after the pull out of Cluj. Somewhat contrary to expectations (that whole "sylvan" thing in the name), the area is not heavily forested. It reminded me a bit of the Scottish highlands, with hills that looked a bit scalped. The agriculture also does not seem as intensive as we saw in Poland and Hungary, though my eye for that is not particularly learned. One of our current hosts suggested that the Austrians and the Russians (most recent occupiers) made off with the timber. We turned off the main highway after about 50 miles, and made our way to Dicsoszentmarton (Tirnameni on your Romanian map), to the partner church of our home Unitarian Church, Cedar Lane in Bethesda, MD. We were greeted by the minister, Endre Nagy (in Hungarian, they put the surname first, but I have flipped the names for our Western readers) and his wife Dodi, pictured above. Daughter Szilla (sp?) and her recent fiancee, Gerard, provide the dazzling English language skills that keep the conversation going. She's an aspiring lawyer and he teaches history -- a pretty good match for me. 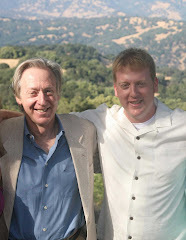 We just missed son Endre, who flew yesterday morning to California for a year at the Starr King Seminary in Berkeley. The family has put us up with wonderful grace and hospitality, which has included good Hungarian food and excellent wine made at home by the good minister. (Every seminary should have wine-making in its curriculum; best wine of the trip.) The talk, and the wine, lasted well into the night. As a devotee of flatland cycling, I have to report that it does not get better, or flatter, than eastern Hungary. We covered about 200 miles in three days. In that time we ascended a couple of highway and railroad overpasses. Otherwise, flat going and some excellent highlights! The highlights included those Hungarian thermal baths, which turn up wherever a city is near a body of water. I was a late convert to the muddy water of the thermal bath, which must be around 115 degrees, but it is a great way to end a long day in the saddle. Hats off to Hungary on those. We also were lucky to be guests in Szegelom (rhymes with "gitalong") at the Riolit Panzic, which had no other guests for the evening. After an unsuccessful negotiation with the proprietress over prices and terms, Matt found himself going face-to-face with her son-in-law, Janosz, who promptly called his wife Christina to translate and referee. Before they were done, Matt had talked on the cell phone to Janosz's brother in Toronto, visited Janosz's home, wangled an invitation to the family's St. Christina party that evening, and secured a ride for us to the thermal baths, which also happened to be the home of about a dozen storks who had built their nests atop the lampposts next to the baths. The party was a lot of fun, exposing us to Hungarian hospitality and cuisine -- the cuisine was delicious but, yes, a little heavy. Riolit Panzic. Write it down. Next time you're in Szegelom. The cycling has gone extremely well. Matt's kept us mostly off the main roads and moving in the right direction. Thursday was a perfect day -- we covered 62 miles before breaking for lunch. Friday was hot, but we hung up another 60 before finding the Riolit. Today had threatening skies, which made it much cooler and easier to travel. We got to Oradea, the first city over the Romanian border, by 2 -- but since we had crossed a time zone, it was 3 p.m. (First time zone crossed on a bicycle!) Tomorrow we will head east from here, which will include more vertical stretches. The Carpathians loom. But we'll try to shorten up on the distances and chug along. Cycling does change one's perspective on many things. Now, when I venture onto a road, my first concern is the quality of the pavement. Most vehicles in Hungary, where some roads are less than perfect, engage in the "road surface tango," which involves finding the smoothest possible surface -- and at least missing the holes -- while also evading oncoming and following traffic. It could be a rather dull video game, sort of like Pong or Frogger. A second change is my attitude when I enter a snack shop during a ride. I am interested in the finding the most efficient calorie-delivery product that tastes good. Fruit drinks, fruit, and candy are at the top fo the list. It's simple refueling. Oradea looks a bit tired and less prosperous than Hungary did. I suspect Romania is a step behind Hungary and Poland in the development scale. This part of the country also suffers from the two-name problem. This trip has persuaded me that if there are two alternative names for individual places, there's been trouble in the recent past. In Poland, many places have a Polish name, a German name, and/or a Russian name. Bad history. Too many foreign occupations. In this part of Romania, most places have a Hungarian name and a Romanian name, the legacy of border redrawing after World War I, which left an undigested Hungarian minority here. A final word on language and keyboards. One excellent thing about being in Romania is the computer keyboard where, which tracks the American version. Hungarian has 44 letters in its alphabet, including 12 vowels. (Don't hold me to those numbers; that's what a Hungarian told me.) So that means that they need to crowd a lot of letters onto the Hungarian keyboard, which moves everything around to where it DOES NOT BELONG. Indeed, the @ symbol can be found almost anywhere on a Hungarian keyboard. A small inconvenience, but entirely unexpected. Budapest, I predict, will be the gem of our tour. It's cosmopolitan, it's beautiful, it's a little dirty, it's inhabited by Hungarians - who are witty and interesting and classy and cool. They are world experts in the art of finessing - witness how they stalled both the Nazis and the Commies from taking total control immediately as they did elsewhere. It's an admirable skill. The photo above was taken at Memento Park, where the Hungarian government has assembled an assortment of ridiculous statues from the Communist era. I am standing (victoriously!) by the famed boots from the Stalin statue in Budapest. The rest of the statue was torn down in the Hungarian Revolution of 1956. NOTE: these are not the actual boots (which were also looted) but instead "an authentic replica of the original" according to the guidebook. Here's a less-famous statue: "Pool attendant speedily returning lost towel." We also visited St. Stephen's Basilica, which, overall, is just another big church. However, inside they have enshrined the Holy Dexter, or the right hand of King (and later Saint) Stephen, who is a major figure in Hungarian history. Look closely - his actual hand is the shriveled black thing in the house. You had to pay 100 forints, or 60 cents, to turn on the house light (as above), and there was a funny episode in which two ditsy Italian girls made extended gestures to dig out the coin from their various purses, unzipping and unclasping and digging through assorted change, then giggling and repeating, as a big crowd looked on. They were obviously used to being pampered by pathetic Italian, but in spite of those connotations I cut my losses and handed over the money, for which I was rewarded with premier standing position and a halting explanation in Hungarian describing how the entire arm was carved up between various countries over the year. I think. Anyhow, the Holy Dexter is in full force on St. Stephen's Day - August 20! - when they actually parade the dead man's right hand all over town. I gotta say, the strangeness surrounding relics is one of my favorite aspects of Christianity. That's all for Budapest folks. Keep your fingers crossed for sunny skies and clear roads as we head inland across Hungary and off into Romania. The photos are out of order, and the last one shouldn't be there at all so please ignore it, but this post is coming from the low-tech member of the team, so I'm taking pride in getting four photos up that I intended to, even if they're out of order. All while struggling with a Hungarian keyboard that has all the symbols in the wrong places. So, Saturday we got to Auschwitz-Birkenau -- see photo of Matt before notorious *work makes you free" sign atthe entrance. We've all been so bombarded with the Auschwitz story and the images that I will include only two of the points that struck me. 70 percent of the Jewish prisoners who arrived at the camp -- really at Birkenau, which was the mass-production facility, with Auschwitz as the initial "beta" site -- were dead within two hours of arrival. So for most of the Jews, it wasn't really a camp, just a place to die. Four SS men could kill 1500 Jews in 20 minutes in the gas chambers. Teutonic efficiency. The head of the camp, Rudolf Hoss, who was not the guy who flew to Scotland to try to end the war in 1940, lived with his wife and five children in a house a few hundred yards from a gas chamber and a crematorium. Then it was back to Krakow for a final rainbow on the main square, and off to the night train to Budapest. We had decided to take a pass on biking through Slovakia. Too many mountains for this old body, and not enough places we wanted to see. After some anxiety about whether we would be allowed on the train with our bikes, we were allowed to cram them into a two-person sleeping compartment with two sweaty Americans . . . us. The photo only begins to tell the tale. But we slept and hopped off the train at the stop before Budapest, Vac, in order to ride in along the bend of the Danube. I do mean that we hopped, since our train was too long for the platform in Vac, so we jumped down with our equipment while the Budapest-bound commuters looked on in boredom. The ride along the river was gorgeous, then into this cosmopolitan city for a tour of the second largest synagogue in the world. The Hungarians get some credit since, after the Nazis killed 75 percent of the Jews here, enough felt comfortable coming back here that there are now more than 50 active Jewish congregations in Hungary. A contrast with Poland. We finished at the thermal baths, a Hungarian passion. The chess game continued for the two hours we were there. With apologies to Damon Runyon, might you call it a permanent floating chess game? After three days on the Polish roads (which were quite good, on the whole), we cruised into Krakow this afternoon, a bit sore and weary, but gratified to have made it. (We left the photo card in our room, so photos will be posted tomorrow.) We've had fabulous weather, and the countryside has been very pretty -- lots of farmers working in rich-looking fields. As for those people who insist that Poland is flat: they're not cyclists. Sure, there are plenty of flat parts, but there's also some terrain. We took a shortcut today, which actually got us where we wanted to get, but at the expense of some hills that reminded me of Western Maryland. We've had a pretty strict division of responsibilities for the ride. Matt's in charge of navigation, repairs, and reminding me to drink more water. (I'm trying.) I'm in charge of trying to survive. It's not a fair division, but (as the Communists used to say, but never meant) to each according to his needs, from each according to his abilities. The first day was 92 miles -- a bit ambitious. The last two have been shorter and easier to manage. Today, for short stretches, I actually felt healthy and exhilirated. It was foreseeable, of course, all this cycling on a cycling trip. I'll be a better person. The people in Poland have been friendly, and have indulged our lack of language skills. I can consistently say in Polish "hello," "thank you," "please," and "rest room." Everything else is pantomime and slow speaking, as though that helps. I experience a bit of schizophrenia over the place. The people are gracious, but we've seen some traces of lingering anti-Semitism, which our Warsaw guide described in unhappy terms. It's hard to reconcile the two, especially since there are so few Jews around. Occasionally I ask myself after an interaction with a Pole, "What would she think if she knew I was part Jewish?" I have been experiencing the shrinking time horizon of the cycling trip. You get up in the morning and think about where you want to get to that day. You're on the road, and think about how far it is to the next place you may want to stop, or the stork that just flew by (we've only seen two sets of storks, so far; a bit subpar). You think about whether it's time to drink some more water (like I said, I'm trying). You admire the view. You wonder about the home you just rode by, or the two little girls carrying a bucket from a berry patch (blueberries? ), or the bus stop in the middle of a state forest which has about a dozen vodka models lined up, very orderly. You marvel at the truck that just whizzed by -- pretty close -- without really making you anxious. The road sign announces a new village with one more incredible arrangement of consonants and vowels -- yesterday we passed one that started "Zdz." Maybe it's time to eat something? The roads are mostly two-laners, without a real shoulder, so you just ride in your lane and hope the drivers will be courteous, which they have uniformly been. On a few bad stretches, I have drifted towards the middle of the road, in search of smoother pavement, which is not a good habit. The drivers can deal with you so long as you just plow straight ahead. That drifty stuff can get you in trouble. But we're off the road for a few days. We'll be here in Krakow for at least two days. We've got a room on the ring road around the Old Town, which is surrounded by a park that was created when Krakowers (?) filled in the moat. Tomorrow we're tourists again -- no longer bicycle athletes -- and Sunday to Auschwitz/Birkenau.